We can fully tailor a show or series of shows, length and content. Please call us to discuss your requirements. The dome can accommodate approximately 40 adults or 60 children unseated. Approximate diemensions are 6m diameter and 5 metres high. A single standard power outlet is required. Our large telescope, a 300mm dobsonian, is also available for hire although best suited to travelling shorter distances around the Te Anau region. Please drop us a line and see how much we can do for you. In addition to our customised presentations we also have two professionally produced full length productions which are around a half hour in duration. A look at 400 years worth of development of the telescope from Galileo to the present day. We hope to be adding more to our collection soon. Let us bring the Universe to you! The Astronomy Fiordland Stardome is available for hire. 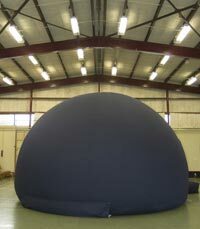 Our portable full dome, digital planetarium is the first example of its type here in New Zealand. It represents the latest in digital technology and has all the benefits of conventional, fixed digital planetariums except for one major difference - we can come to you!!! We can fully tailor a show or series of shows, length and content to cater for your school, organisation or even family event. For example we can plan a presentation to support the learning objectives in the Science: Planet Earth and Beyond strand of the National Curriculum. Alternatively leave it to us. Please call us to discuss your requirements. Please do not mistake this for an old analogue or pinhole projector of which there are a few examples in New Zealand - they are light-years apart from Fiordland Astronomy's awe inspiring stardome. Think slide show vs 360° powerpoint and film on (a)steroids! For schools $165 an hour for 40 students and $2 a head after that to a maximum of 60. Please note for senior students 45-50 may be capacity. Teachers are free of charge. Travel charges and Hall hire, if needed, will be quoted on a case by case basis. We welcome any private hire enquiries, not just schools. Just call or email us for a quote. PLEASE NOTE We are taking bookings for PRIVATE DOME HIRE over the 2017-18 summer period and will still be replying to emails. Please bear with us as it make take a little longer to respond than usual.